Dinner @ Nantsuttei Ramen, located at “Itadakimasu”, a whole floor in Parco Marina Bay at Millenia Walk dedicated to Japanese themed restaurants.This place drew a huge crowd on the weekend we visited Keisuke Tokyo Ramen. So we decided to visit this joint on another weekend, and here we are! We ordered 2 ramen dishes and a plate of gyoza. 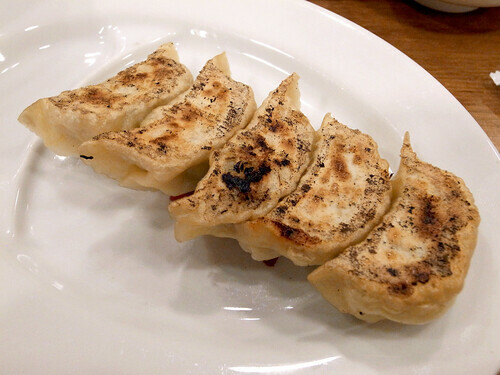 The gyoza was first to be served and we were thoroughly disappointed with the presentation. At $6.00, we found it ridiculously priced for 5 of these tweeny pieces 2 index finger digits in length! Finger food with no pun intended! Clearly this is food for hobbits. 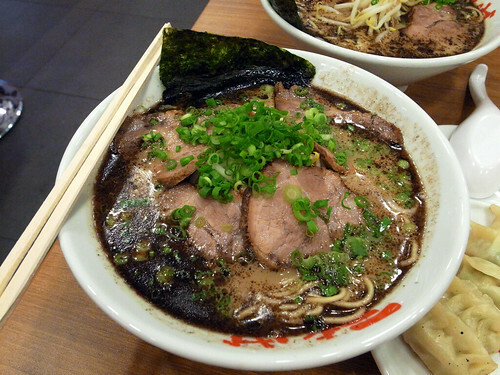 J’s Char Siew Ramen. 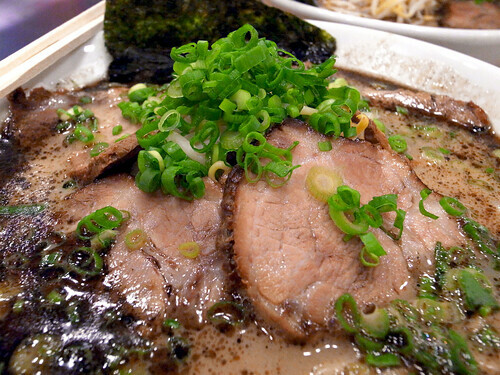 The soup base is a thick tonkotsu concoction with rich taste and aroma of black roasted garlic oil. The 4 slices of char siew were also generously arranged over the noodles, topped with a sprinkling of bannou negi (green spring onions aka scallions). Closeup on the char siew and juilienned scallions. 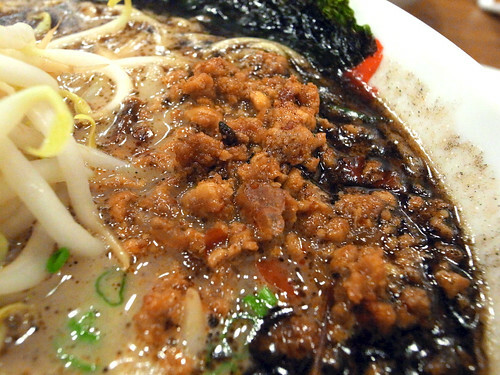 The ma-yu (roasted garlic oil) reminds of the oil spill along the US coastline off Lousiana. My order was “Dragon Ramen”, which was basically a typical ramen bowl added with minced pork stewed and simmered in red chillies and peppers. Well…. breath fire I did not… not dragon enough apparently, vis-a-vis Volcano Ramen from Ajisen. Close-up on the pepper and chilli minced pork. The serving could have been more generously like the char siew slices. One last shot before digging in. Overall, I would say that the dining experience was acceptable. 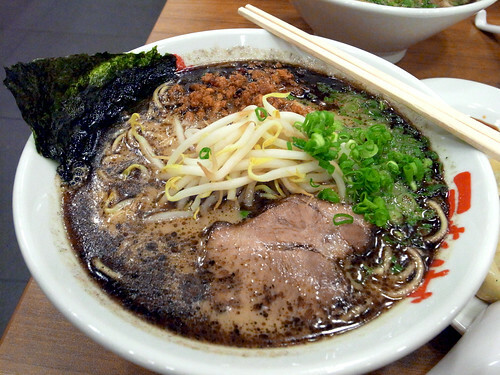 But to call this place as THE place to go for ramen is clearly an overhype. Compared to Keiskuke Tokyo Ramen located just 2-3 shops away, this place clearly lacks the surprise element diners had probably anticipated from all that’s been reviewed on this place. Would we be back again? Well… perhaps. 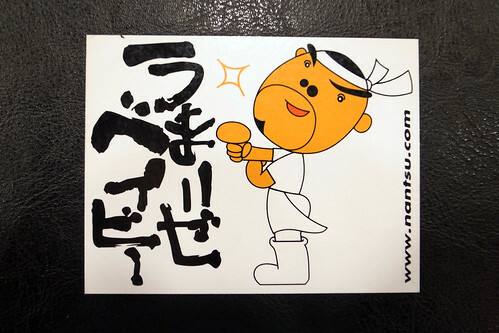 But no more gyoza and no more queues. This entry was posted on August 15, 2010 by Alan (travellingfoodies). 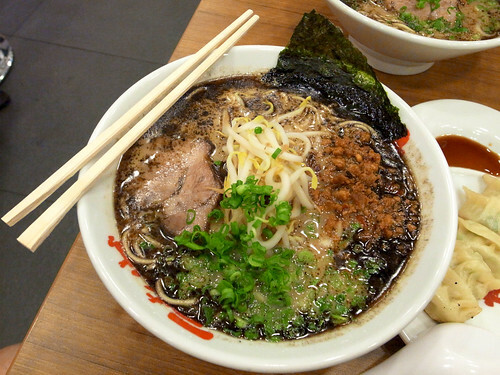 It was filed under Food and was tagged with Parco Millenia, Singapore.